Climate-related consequences are raising food prices, joblessness, crime, and instability. PONGOLA, South Africa — On the last Friday of January, payday on the sugar cane farms of northern KwaZulu-Natal province, a hot sun beat down on the red clay of Cobus Horn’s equipment yard. Nduku Msimanga, taut and muscled as a welterweight boxer, waited there with three other tractor drivers to receive unusually meager pay stubs. Msimanga, who is 36 years old, supports two teenage boys, a seven-year-old girl, and his wife on the wages he’s earned on the Horn family sugar cane farm just outside Pongola since he was 23. His pay, usually about 5,000 rand a month ($US 300 at current exchange rates), is tiny by western standards but above average on South African farms. This year Msimanga’s pay stubs are half that, a reflection of just how deeply South Africa’s worst drought in 34 years is attacking the country’s nearly $US 9 billion farm economy. Though South Africa’s 35,000 large commercial farms have been losing workers for decades due to consolidation and mechanization, industrial agriculture still accounts for more than 650,000 jobs, or seven percent of the country’s working adults, according to Statistics SA. At least 1 million more South Africans work full or part-time on the 1.3 million small and subsistence farms. Overall, just two of three working age adults are employed. Unemployment is 35 percent, according to South Africa’s statistics bureau. The dry weather and record-setting heat started a year ago and are not expected to end for 11 or 12 more months. In an arid country accustomed to episodic dry spells, the 2016 drought is nevertheless producing uncommon hardship. Agronomists with Grain SA, a national farm association, project that 30 to 40 percent of the country’s 12 million-metric-ton corn crop will fail. South Africa, typically a grain exporter to southern African nations, is expected to import 3 million to 5 million metric tons of corn by the end of the year at a cost surpassing 15 billion rand ($US 927 million). Food prices are rising and could increase by 25 percent by year-end, says Grain SA. That is aggravating rising inflation and playing a substantive role in depressing growth in South Africa’s $US 324 billion GDP to around 1 percent annually. Each week that passes without rain draws South Africa closer to what could be the most significant crop disaster in its history. On that last Friday of January, Msimanga experienced his own personal drought effect. He received pay for just 12 days of work for the month, a little more than 2,000 rand ($US 123). Horn cut his farm’s work week to four days. Earlier in the day Horn informed Msimanga and his other senior skilled workers that the short weeks would continue indefinitely. The hot and dry conditions had brought to a standstill much of the cultivation and irrigation work on the 315-hectare farm (778 acres). There was no water. Horn, a 36-year-old farmer, described his strategy as having two goals: One is to use the time for equipment maintenance and repair. The second is to send a signal of loyalty to his skilled workers. Less skilled workers, mostly women who weed and help with vegetable production, are working two days a week. One other social consequence of the drought, which South African researchers link to climate change, also is feared. Across all of South Africa, residents worry that as the drought pushes workers off of farms, the country’s notoriously high rates of theft, assault, and home break-ins will climb higher. Dry weather has killed the subsistence gardens in South Africa’s informal settlements that the poor rely on for a good deal of their food. In many places men talk about the desperate honor of risking jail terms by stealing to gain food for their families. In late January taxi and truck drivers in Pongola staged a “slow-down” demonstration to protest a surge in window smashing and vehicle thefts. They formed a long caravan on the national N2 highway through Pongola’s center, and near the city’s police station, and drove their vehicles at a crawl. For those reasons and more, the new work schedule came as no surprise to Msimanga. The 17,000 hectares (42,000 acres) of cane fields that surround Pongola, a farm town of 2,000 residents, is normally a sea of moist green cane lapping at the slopes of rocky highlands. This year the cane fields are yellowed and stunted. In KwaZulu-Natal, which lies along the Indian Ocean east of Johannesburg, and is one of two neighboring provinces that form the center of South Africa’s 19 million-metric-ton sugar cane production sector, mill managers predict that the sugar harvest will be cut by a third. Pongola’s 62-year-old mill, the economic heart and soul of a sugar town, is normally a hive of activity in preparation for the start of the milling season. In early February it is as quiet as a retirement home. Milling will start in April this year, weeks later than normal. The mill anticipates crushing 1 million metric tons of sugar cane, down from the typical 1.5 million-metric-ton harvest. The cane cutting and hauling work will be weeks shorter than normal, meaning that farmers and farm workers are sharing sharp reductions in revenue. Msimanga says he can endure smaller pay stubs. South Africa long ago accepted as scientific fact and impending reality the idea that its arid grasslands, water-scarce inland farm regions, and parched cities would be bullied by climate change. Planning documents in the five national departments that have a role in managing water supply — Water and Sanitation, Energy, Agriculture, Environment, and Mineral Resources — reflect progressive ideas about conserving water, and improving water distribution, storage, and transport. The two- year-long South Africa drought is revealing the accuracy of those projections. Even as South Africa anticipated the effects of climate change as a policy consideration, the country forged ahead with a western, resource intensive, water-consuming development strategy. South Africa constructed few new water storage reservoirs. Its cities waste millions of cubic meters of water through leaking pipes and poorly maintained drinking water and wastewater treatment plants. Irrigation networks are old, leaky, and not nearly as efficient as they need to be. South Africa also is pursuing a campaign to develop more coal mines and build more water-wasting coal-fired power plants, two of which are among the largest in the world and are under construction in provinces with endemic water scarcity.In 2013, the National Planning Commission also published the National Development Plan 2030, which argued for changes in the country’s operating system. The report’s authors presciently warned that climate change in South Africa would produce rising temperatures, erratic rainfall, extreme weather, reduced food production, rising food prices, and difficulty in providing adequate municipal water supplies. In effect, said the report, climate change could lead to serious ecological and economic consequences, and produce social instability in South Africa, just as a deep four-year drought in Syria from 2007 to 2010 was a starting point for their disastrous civil war. Nearly two decades into the 21st century, South Africa is poorly positioned to respond to the serious contemporary consequences of heat and drought that researchers are now telling national leaders will get worse. The drought, in other words, is exposing severe weaknesses in the country’s operating strategy that will take tens of billions of rands to fix. Naidoo, who is 50 and a chemical pathologist, is among the select number of technical specialists advancing ideas to President Jacob Zuma to expand water storage, fix leaking municipal water supply networks, and grow water-conserving wind and solar electrical generating capacity. The National Water Commission also is working to convince South Africa’s 35,000 big farms, most of them owned by white farmers, to diversify cropping patterns. The drought is displaying how vulnerable South Africa’s monoculture harvests of corn, soybeans, sunflowers, sugar, and wheat are to climate change. For the first time in years, South Africa also is virtually certain to be a sugar importer as well. Sugar cane fields are lean across almost all of Mpumalanga and KwaZulu-Natal, the two South Africa provinces that produce the country’s typical 19 million metric tons of cane, and 2.2 -million -metric tons of finished sugar every year. Three quarters is sold in domestic markets and a quarter is exported to southern Africa nations. The South African Sugar Association, which represents the 24,000 sugar cane producers and 14 sugar mills in the 12 billion rand industry, projects the cane harvest will be 3 million metric tons less than last year. The result could be a 500,000 metric ton drop in sugar production, or 31 percent lower than in 2015. It is not known how many of the industry’s 79,000 workers will be retrenched this year. The Saturday after he was paid, Nduku Msimanga, the 36-year-old sugar cane worker, boarded a minibus to Ulundi, a small town 100 kilometers (62 miles) south where his family stays. The day was bright and hot. Msimanga was worried. Ulundi’s water supply dried up last fall. Water tanker deliveries since have been inconsistent. Residents have gone days without filling their water jugs. His family had a request. “They need water. They asked me to take some,” he said. The drought cannot be managed the way previous droughts have been managed. Across Pongola, from the service stations and lodges, restaurants and farm supply stores, people are preparing for more hard times. Sugar cane touches every facet of Pongola, and has since the late 1940s and early 1950s when cane growing first emerged as the region’s staple crop. Consolidation has produced around 128 big farms that directly employ 30 to as many as 90 farmworkers each. Thousands more people are connected to every other business in town. The drought is seen as a maddening betrayal, a signal from Mother Earth that the wealth from sugar, planted and harvested in an African valley of incomparable beauty, is not nearly as assured in the 21st century as it was in the 20th. Two pieces of infrastructure illustrate that narrative. The first is the sugar mill, which was built in 1954, employs 460 people, and has been stymied by unplanned operational shutdowns and unexpected maintenance issues for several years. The current owner, RCL Foods, has launched a modernization campaign for the old mill that farmers say has not been as successful as advertised. Last year, due to equipment problems, sugar cane from Pongola was shipped to another mill out of town to be crushed. When the Pongola mill goes down, the entire town sags. The second vital installation is the Bivane Dam, upriver on a branch of the Pongola River. The big concrete dam and the sizable reservoir behind it are designed to store 115 million cubic meters of water for sugar cane irrigation and to supply fresh water for Pongola’s drinking water system. Finished in 2001, the 150-million-rand dam crosses a narrow red rock gorge and is one of the last big water storage projects constructed in South Africa. It’s also the biggest privately-built dam and reservoir project ever built in the country. Its completion by the Impala Water Users Association, the farmer cooperative that manages the area’s extensive network of concrete irrigation canals, prompted a civil war among Pongola’s sugar cane growers, half of whom protested paying the 1,098 rand-per-hectare annual fee to finance the dam’s debt. Lawsuits were litigated well after the dam began supplying water to Impala’s extensive network of irrigation canals. The griping ceased in 2008 when settlements were reached in the litigation and Rand Merchant Bank reworked the construction financing package to a more financially sustainable 30-year amortization schedule. In the last two years the fiercest lions among the critics stopped roaring. The dam’s stored water enabled sugar producers to harvest a full crop last year even as rain stopped falling in November 24, and carried farmers through much of the growing season even though the reservoir was already a third empty the following January. Over the last year Impala regulated the flow from the reservoir. As town after town in northern KwaZulu-Natal ran out of water, the Bivane Dam’s role was the provider of last resort. Just 11 million cubic meters of water, less than 10 percent of capacity, sit in the reservoir’s shallow bottom. Water allotments to farmers ceased at year end. 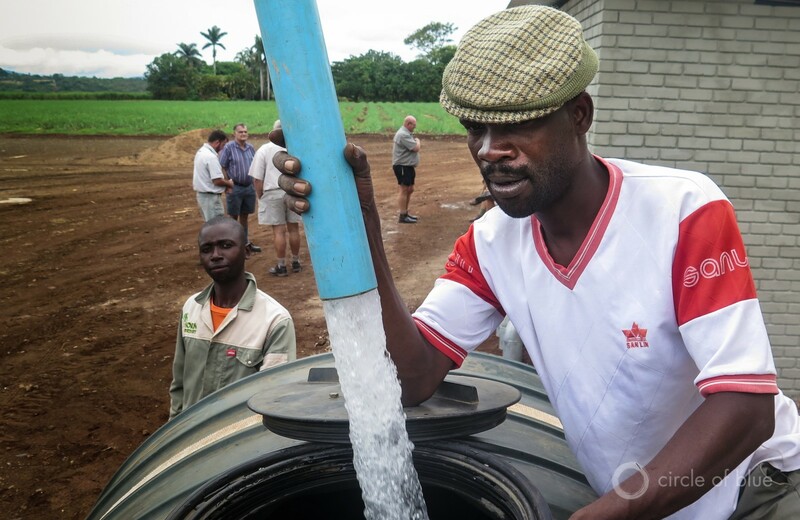 Now managing Bivane’s paltry water supply is a day-by-day enterprise. In the last week of January a brief deluge fell overnight on the highlands, poured down rocky slopes, and prompted Boonzaier to issue a mid-morning text message alerting farmers that there would be water in the irrigation canals the following day. Cobus Horn, a sugar grower working in his equipment shed, reacted to a signal on his cell phone. He smiled when he read it.